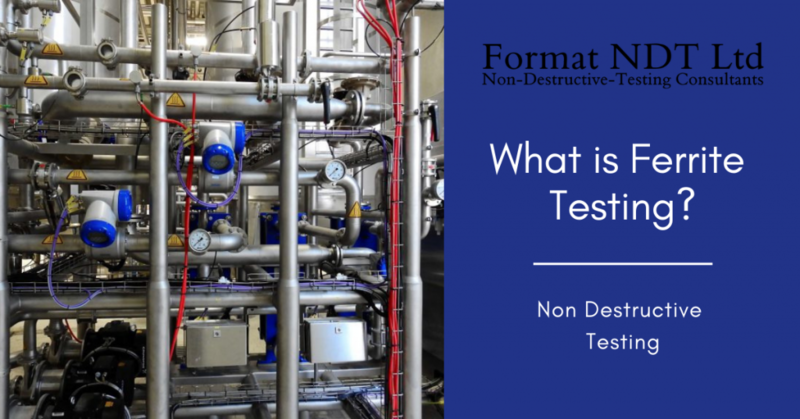 What is ferrite testing? Ferrite testing is an accurate, very quick and inexpensive method of determining the percentage of ferrite in austenitic and duplex stainless steel. Material testing technicians will carry out this type of test to make sure that the stainless steel being used in or for various processes is properly tough, is resistant to corrosion and will not crack. Different types of stainless steel require different percentages of ferrite, depending on the job they need to perform. Ferrite testing is used within a range of different industries. These include chemical, mining, manufacturing, oil and gas, paper and power generating. Ferrite testing verifies whether heat treatment applied to the material has reached the required performance balance. It also shows whether there are any damaging third phases in materials, which could later inhibit the performance of stainless steels. It will also highlight any weld strength deficiencies. What Does Ferrite Testing Do? Ferrite testing is used to assess the content of ferrite in stainless steels in elements of machinery such as welds, or within overlays in field and laboratory settings. It is also used to determine ferrite content percentages of duplex stainless steel piping, within pressure vessels, tanks, castings and also within any mechanical components. Ferrite testing services from a Non-Destructive Testing service such as Format NDT can help prevent potential failures and the chance of increased costs of maintenance due to corrosion or cracking of parts, or mechanical failures. How To Determine what the Correct Ferrite Percentage is? The ferrite percentage needed depends on the type of stainless steel that is being worked with. 300 series stainless materials like 304/L and 316/L have an austenitic microstructure. They are also non-magnetic. This means that in their unheated and untreated state they are free of ferrite, as that is magnetic. These alloys will also have some ferrite in them when they are worked. Ferrite presence can have a detrimental effect and cause corrosion in some cases. There will also be certain situation in which the magnetic tendencies of ferrite can have an effect on how the end product will perform. Alloy composition is the factor that controls the ferrite content of the cast alloy. Carbon, nitrogen, nickel and manganese are austenite formers. Increasing their content will mean that the capacity for ferrite to form will be greatly reduced. Heating will dissolve much of the retained ferrite. However, cast products are made to contain increased amounts of ferrite and heating will not turn it completely into austenite. What is the Ferrite content of austenitic stainless steel? An ideal percentage would be in the region of four to eight. This percentage is effective in helping to control and stop problems such as micro-cracking of weld metal as it cools. What is the Ferrite content of duplex stainless steel? An ideal percentage for duplex stainless steels is thirty five to sixty five percent. Fifty percent is considered to be the optimum. This will ensure corrosion resistance and give the required toughness and strength. 35 to 65% ferrite is preferred, though 50% is optimum. Testing for ferrite content is reliable, very quick and you will get immediate results if you use a reliable company such as Format NDT. We will place a probe on the material that is being investigated. From this, a closed magnetic circuit will be formed. This will allow Format NDT to measure any magnetic permeability. This is then measured against the standard percentages of materials which are known to have ferrite content. How permeable it is to the material being analysed will. The permeability of the material being analysed indicates the ferrite content percentage. The technique we use is non-destructive testing. The surface that is being tested needs to be clean and smooth. The benefit of a choosing Format NDT to help with ferrite testing means you’ll get experience and high quality service from a company who really understand non-destructive testing. Testing for suitable ferrite content allows the steel to perform well meaning that is can balance the properties of resistance to corrosion, prevention of cracks and its overall strength. Our testing ensures obtained ferrite readings are accurate and are matched to truly reflect the materials the samples are taken from. We work in a quick and professional way to make sure that you get the results and information you require as soon as you need them.